Burned out on high-definition, high-melodrama coverage of the London Olympics? Here’s a nice lo-fi counterpoint: Lillian Schwartz’s early computer animation OLYMPIAD (1971), with music by Max Mathews. It was during this period that Schwartz — now 85 — created some of the very first examples of digital animation (including OLYMPIAD, inspired, she said, by Eadweard Muybridge’s human motion studies). At the screening, she told us about her laborious working method: first planning her animations on graph paper, then writing programs to render them, manually creating punch cards to run the programs, and individually photographing each frame of the rendered work off of a monitor. Newly restored versions of many of Lillian Schwartz’s most important works will be screening at MoMA on December 10. Meanwhile, you can find a number of her pieces on her YouTube channel. Can images and sounds be understood through their decomposition—and how are we to decompose them? Maximus Clarke’s and Ted Hayes’ split show at Devotion Gallery peers through images and tears apart sound in an effort to limn their boundaries and recapitulate them in new forms, consuming their source media in the process. Hayes’ “Deconspectrum” guts our monolithic perception of sound and lays out its component viscera in the form of flickering, colored light-cubes, leaving them out in the open to decompose into a new and unprecedented autonomy. “Living Room,” which will be on view at The Jewish Museum from July 31 to October 23, combines computer generated images of the apartment of Manfred Normburg, a German-born Jew, and his memories of everyday life in pre-war Berlin to study the intersection of personal memory with historical events. “My entire body of work in the last few years has to do with memory and reconstructing reality through different processes,” Zack told Reuters. Using four large-scale, computer-generated 3D prints, Zack shows cross-sections of the living room, dining room, kitchen and other spaces, including furniture, appliances, tableware, wallpaper and light fixtures. 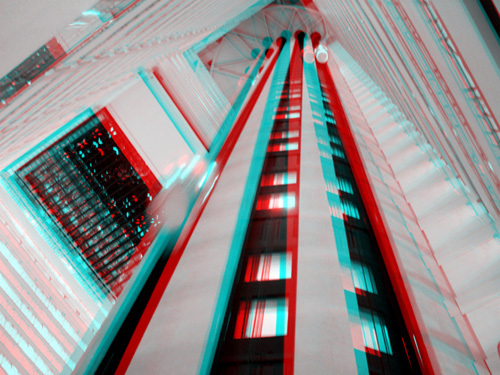 3D glasses give the oversized images immediacy and depth. More info about the exhibition is here. According to Studio Daily, the film has a north American distributor, but no release date yet has been announced yet. Between this and Werner Herzog’s superb Cave of Forgotten Dreams, the Germans are taking the lead in making 3D film into an artistic medium, not just an action-movie gimmick. 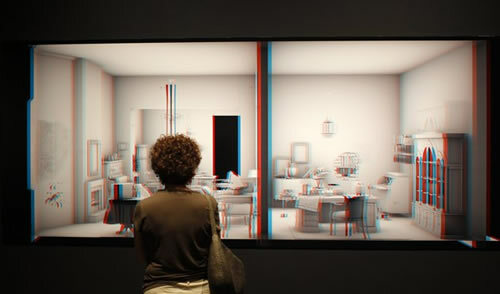 It’s a great visualization of the boom-bust cycles that stereoscopic technology has gone thru over the last century. Opening the 2011 Armory Week is SONIC ARCHITEXTURES, an evening of performances remixing strands of analog and digital improvisations – a balance of post-punk impulses, subliminal electronics, vinyls and harp with arty experimental films, including Rey Parla’s “Rumba Abstracta” and Peter Gregorio’s “Holographic Principal Generator”. Framing the night’s performances are Maximus Clarke’s anaglyph 3D projections, viewed with spectacles dubbed FREEDOM FILTERS. Audiences are encouraged to participate by having their portraits taken on the greenscreen for future retrospection. Thomas Watkiss opens the night with hypnotic drones meticulously composed to set the ambiance. Using dense layers of symphonic chords, composer Zach Layton performs an improvised set with percussionist Ryan Sawyer aka Lone Wolf. Renowned as an avant-garde ensemble, MERCE is the musical vision of Maria Chavez and Shelley Burgon. Creating a sonic atmosphere, Chavez’s turntables culls from her “pencils of sound” while Burgon’s harp melodics unifies the whole experience. Tonight, Merce collaborates with visual artist Rey Parla, whose rigorous and experimental multimedia work is a dance of stimulating visual music. SONIC ARCHITEXTURES is curated by Helen Homan Wu, and co-presented by ARTCARDS for 2011 Armory Week New York. MERCE is a duo comprised of harpist/electronic musician Shelley Burgon and turntablist Maria Chavez. The duo performs improvisation-based song pieces based on loops and live processing. Merce has performed at Roulette, Issue Project Room and most recently for the Saturday Sessions at MoMA PS1. Thomas Watkiss constructs his sound works from a careful mix of guitars, 6 string bass, synthesizers and field recordings to create dense ambient atmospheres laced with heavy metal distortion. Thomas has performed across the US and toured extensively throughout Europe for his fourth LP record release ”Whote – Align”. Watkiss recieved an MA in Interdisciplinary Studies at Konstfack and is a member of ASCAP living and working in New York City. 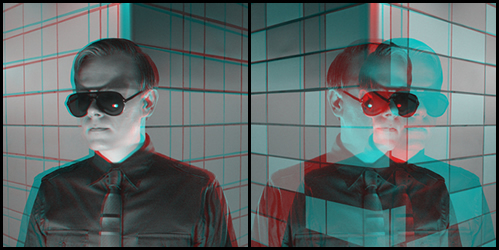 Maximus Clarke is an experimental visual aritst. He is also the multimedia electropop performer Maxx Klaxon. He grew up in Miami, studied literature and film at the University of Florida, and received an MFA from the Graduate Film Conservatory at Florida State University in 1999. After moving to New York City, he briefly worked in film and television production. 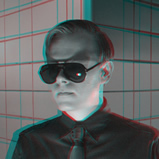 Max is currently exploring the medium of anaglyph 3D, producing stereoscopic still images and videos, and developing new multimedia performance pieces featuring 3D projections. 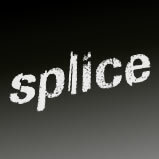 For the past 5 years, he has been the co-curator of SPLICE, an electronic music performance series based in New York City. Zach Layton is a guitarist, composer, curator and new media artist based in Brooklyn with an interest in biofeedback, generative algorithms, and free improvisation. Zach has performed and exhibited at The Kitchen, ISSUE Project Room, PS1, Sculpture Center, Transmediale Berlin, Roulette and many other venues internationally and locally. He has collaborated with Vito Acconci, the Joshua Light Show, Andrew Lampert, Bradley Eros, Alex Waterman, Luke Dubois & Matthew Ostrowski (Fair Use Trio), Tristan Perich, MV Carbon, Jessie Stead and many other artists, musicians, filmmakers and friends. Ryan Sawyer aka Lone Wolf (b. 1976) grew up in San Antonio, Texas, where he played drums in various punk rock bands, most notably, At The Drive-In. After 21 years in Texas, he decided to move to New York to pursue a formal education of music and broaden his understanding of music making on the drum set. Ryan has played and recorded with hundreds of improvisors and bands while maintaining his own groups (Tall Firs, Glass Rock, Stars Like Fleas) throughout the years. His collaborations include Charles Gayle, Thurston Moore, Jandek, TV on the Radio, Celebration, Scarlett Johansson, and Rhys Chatham. Ryan also led and co-wrote the New York Chapter of The Boredoms’ 88 Boadrum, a piece that incorporated 88 drummers playing an 88 minute piece of music co-written by Ryan Sawyer and Gang Gang Dance. Peter Gregorio works in large-scale painting, print, video, and installation, creating pieces and experiences that remix given architecture with new cultural landscapes and contemporary ideas in cosmology, post-humanism, and information dynamics. He has exhibited work nationally and internationally, as well as directed and organized independent projects. Gregorio is the Founder and Editor of VECTOR Artist’s Journal. He currently lives and works in New York and is a resident at the ISCP. Rey Parla is a painter and filmmaker. He creates what he calls “Scratch | Graphs” much in the same way as he works on his Visual Music films: distressing the celluloid, deconstructing and rebuilding the emulsion with color and chemical liquids. Rey makes camera-less abstract photographs by dealing directly with the materials at hand. “Scratching is a primitive act. It allows me to connect with a much simpler side of humanity.” He currently lives and works in Brooklyn, New York.